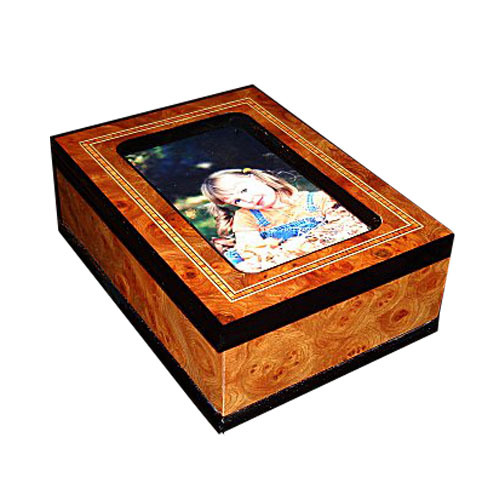 If you are looking for an elegant musical jewelry box that will hold a photo, this is it! A burled Elm cabinet inlaid with a micro-multi-wood design sandwiched between a double filetto border which encompasses the photo area. This superb box's 36 note Reuge movement that plays, "Memory" has become a somewhat rare find in Reuge tunes. Install your dearest photo and send a very sweet and poignant message. The tune is activated when the lid is opened. The interior is of a beautiful suede lining and is appropriate for a gentleman's or lady's gift.